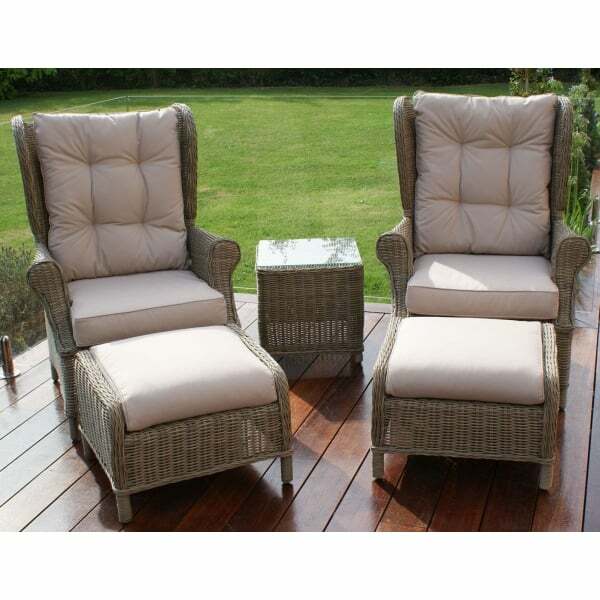 This stylish high back lounge set makes a fantastic addition to your conservatory, patio or garden. The padded high back seats provide comfortable support and have a 47cm high seat position. This set also features 2 matching footstools with padded cushions which can be used to aid relaxation or provide extra seating when those unexpected guests arrive. An attractive glass topped table can be placed between the chairs to provide a resting place for drinks or magazines. The rounded synthetic rattan weave is particularly attractive, weatherproof and low maintenance. This versatile set can be used in the garden or all year round in a conservatory. Simply store the cushions indoors during severe winter weather. The lounge set includes a 1 year manufacturer's warranty.